After 10 years of travel and three months orbiting the comet 67p/Churyumov-Gerasimenko, the European Space Agency's (ESA) Rosetta spacecraft is poised to deliver its landing probe, Philae, to the comet's surface -- a first in history. You can witness this historic event in the making through a live stream of the event from ESA. Tune in to ESA's webcast, or come up to Chabot Space & Science Center to share the experience on the planetarium dome. 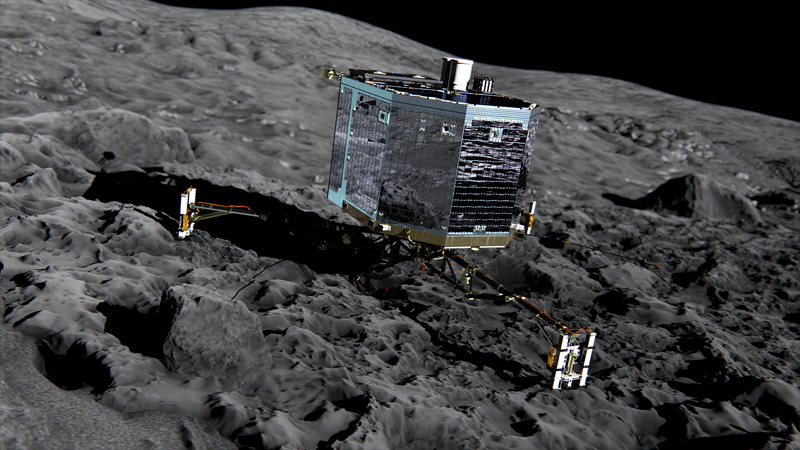 Philae's expected landing time is around 8:00 AM PST on Wednesday, November 12. Chabot's doors will open at 6:00 AM. About seven hours before landing, Philae will be released by its mothership, Rosetta, and then coast the 14 miles to the comet at a leisurely 2 miles per hour. If you are an insomniac, you can watch the live stream at home from midnight to 8:00 AM, though the most exciting moments will likely be around launch and landing. This is the moment from Star Wars when the rebel pilot drones, "Almost there…" as he prepares to fire torpedoes into the Death Star—and though the nearly three-mile-long comet would be a death star of a sort if it collided with Earth, in this case its orbit never carries it close enough to us to be that kind of a concern. Upon contact with the comet's surface, Philae will fire two harpoons to bind itself to the comet. Its landing legs will also absorb the impact of touchdown to prevent the small probe from bouncing back into space. The comet's surface gravity is so weak that the velocity needed to escape its pull is only 3 feet per second—about the same speed Philae will have upon landing. Philae packs a number of scientific instruments into its three-foot-wide body, including an X-ray spectrometer, a combination gas chromatograph/mass spectrometer, infrared and visual imagers, a radiowave sounding system, an electrical sounder, an acoustic monitor, a magnetic and plasma monitor, and a drill for taking soil samples. The suite of instrumentation is geared to tell us as much about this comet specimen and in as much detail as possible, fueling a major leap forward in our understanding of one of these time capsules of the solar system. The Rosetta mission's goal is to investigate evidence locked up in cold sleep in the comet's ices and soil for billions of years, from the formation of the solar system, and decode the ancient secrets. Being bits of material left over from the earliest times of our solar system, comets enable us to see deep into the past and learn about the conditions in which the planets, including Earth, formed. In fact, Rosetta was named for the Rosetta Stone, the Egyptian stele bearing a text written in three ancient languages that enabled archaeologists to decode ancient Egyptian hieroglyphs, thereby giving us a better understanding of that ancient civilization. The smaller landing probe, Philae, is named after the island in the Nile River on which the Rosetta Stone was found. Rosetta was launched in March of 2004, and has spent the past decade maneuvering into an orbit that matches its target. It spent a number of months in hibernation, when its trajectory carried it too far from the sun for its solar panels to supply much electricity. After a successful wakeup call last January, Rosetta has spent the months since making observations of 67p/Churyumov-Gerasimenko as it made its final approach. Then in August it maneuvered itself into a tenuous orbit around the comet, surveying the surface in search of a landing site for Philae.